One of the most important requirements when investigating deadlocks is actually having a deadlock to investigate. In my last blog I wrote some code called DeadlockDemo that used a bunch of threads to transfer random amounts between a list of bank accounts before grinding to a halt in a deadlock. 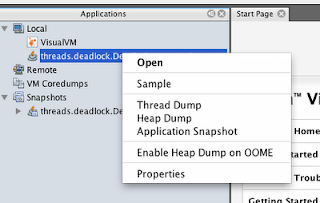 This blog runs that code to demonstrates a few ways of obtaining a thread dump. 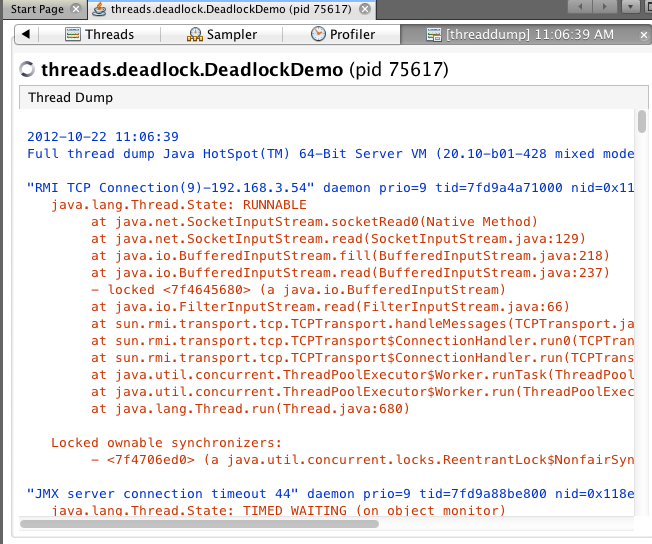 A thread dump is simply a report showing the status of all your application’s threads at a given point in time. The good thing about it is that it contains various bits of information that will allow you to figure out why you have a deadlock and hopefully allowing you to fix it, but more on that later. If your Java application is running on a UNIX machine the first, and possibly easiest, way to grab hold of a thread dump is to use the UNIX kill command via a terminal. The PID for DeadlockDemo is, in this case, 70201 and is taken from the output above. Note that different flavours of UNIX or different ps command line args can produce slightly different results, so check your man pages. Although the -3 above is the SIGQUIT (equivalent to a keyboard ctrl-D) argument, if Java receives this signal it will not quit, it will display a thread dump on its associated terminal. You can then grab hold of this and copy it into a text file for further analysis. 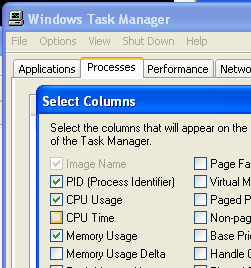 Getting hold of a PID in Windows is a matter of opening the Windows Task Manager. Task Manager doesn’t display the PIDs by default and so you need to update its setup by using the view menu option and checking the PID (Process Identifier) option in the Select Columns dialogue box. 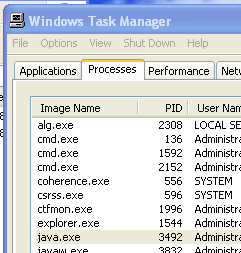 Next, it’s just a matter of examining the process list and finding the appropriate instance of java.exe. Once the command has completed you can grab hold of the output and copy it into a text file for further analysis. 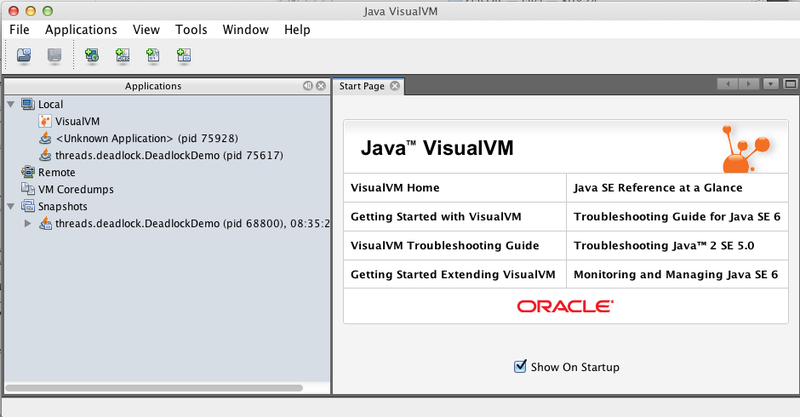 jVisualVM is the 'Rolls Royce' way of obtaining a thread dump. 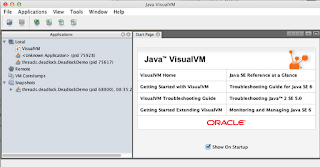 It’s provided by Oracle as tool that allows you to get hold of lots of different info about a Java VM. This includes heap dumps, CPU usage, memory profiling and much more. 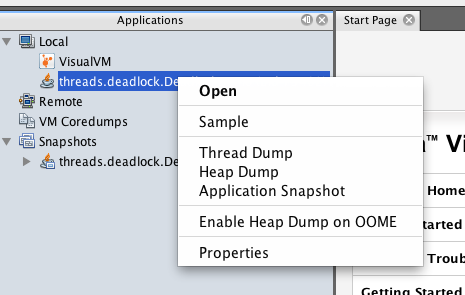 To obtain a thread dump, find your application in the left hand applications panel, then right click and select: “Thread Dump”. 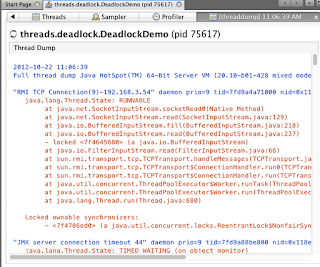 Having obtained a thread dump, my next blog will now use it to investigate the what’s going wrong with the example DeadlockDemo code.